Brush on fiber gel that adheres to skin and eyebrow hair for an instant brow lift. Our tapered brush builds the appearance of your existing brows to look thicker and more luscious. Go for a natural look or build up for more drama! My Review Of The Younique Precision Brow Gel : I love my 3D Fiber Lashes so when I heard they were coming out with a similar product for brows, I was very excited to try it!. My brows don’t really need more volume or length but they do need as much extra color as possible. I prepped and shaped my brows using the Precision Brow Liner Pencil and then applied the Fiber Brow Gel. The available colors are light, medium and dark. I have very blonde eyebrows but to be honest the light is very light, I plan to try the medium as well for when I want more defined brows. This product is very easy to use and to control where it goes. I usually apply, let it dry and do a second coat to get it just right. 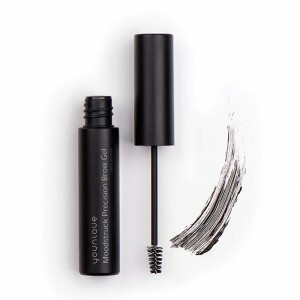 Overall I think this is a great product for easy eyebrows and I think it’s going to be another one everyone falls in love with like the mascara.